Check rates from all banks and other top lenders. Pick and pay for only the features you need. Apply securely online in just minutes. 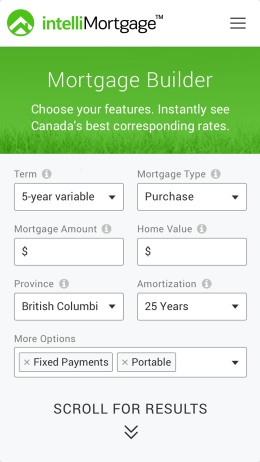 Canada's fastest easiest mortgage paperwork system. Rates on intelliMortgage.com are commonly the lowest in Canada and always in the best 1%. If you get a lower rate elsewhere we’ll match it or pay you $500. This is a sample interest savings over five years, based on a $300,000 mortgage, a 25-year amortization and Mortgage Builder rates as of March 14, 2017. OAC. A job letter. Job letters should be on company letterhead and show your start date, position, guaranteed salary/wages, and a human resources contact with phone number. Bank or financial statements must always show your name, account number and dates. Gifted down payments must generally be from a parent, sibling or grandparent. Otherwise the money may be considered borrowed funds, which may affect your ability to qualify. Online statement printouts are fine, as long as all info appears on one page, or if multiple pages, the account number appears on every page. If you bought your home on a private listing website (like propertyguys.com), provide that listing instead. Copy of driver’s license, passport, or other government-issued photo ID (but not a Health card). Online screenshots are OK if they show all of the required information. Latest property tax statement and/or proof of payment of tax due. This can be a copy of your latest homeowner’s insurance statement or a copy of the insurance policy itself. * Lenders sometimes require other documentation, depending on their policies. Depending on your qualifications and paperwork, approvals may take more time. If your situation doesn’t match the above, simply email us and we’ll point you in the right direction. OAC.